As I get nearer to the end of my twenties I’ve really started taking care of my skin. I have a baby face and constantly get ID’d when buying painkillers from Sainsbury’s – which I believe is all down to my little up-turned nose – but I know that the time will come when my wrinkles get deeper and my skin isn’t as plumptious. So over the past year I’ve begun taking preventative measures to make sure that I can hang on to my baby face for as long as possible. I have honed my routine so that now I actually look forward to getting home every night, pulling my hair up into a pineapple, chucking on my pjs and removing my makeup. I am definitely getting older. I swear by Liz Earle’s Cleanse and Polish for removing any trace of makeup from my skin. It’s soft, gentle and really moisturising, which revives my face after a sluggish day staring at computer screens. If I’m wearing a heavy eye or a bold lip, I’ll usually bust out my trusty Bioderma Sensible Micelle Solution for the first swipe and then follow with the cleanser as I hate rubbing eyeshadow around my eyes, turning into a panda. I follow-up by patting a couple of drops of Lancôme’s Advanced Génfique Youth Activating Concentrate around my face and up my neck. This helps revive my skin, making it look fresher and feel much softer. Once I’ve let that really soak in I apply Lancôme’s Hydra Zen Moisturiser all over my face and neck, giving myself a mini massage in the process. This cream is a godsend to my skin. It soothes, softens and gives me a healthy glow. Before I call it a night I dab La Roche-Posay’s Effaclar Duo [+] to any breakouts or redness across my face. This product is the hero of my routine, taming an out-of-control beast of a spot within days. I swear by it and have since got my mum hooked too. I use this every morning and evening and have seen a definite reduction in the number of spots I get. 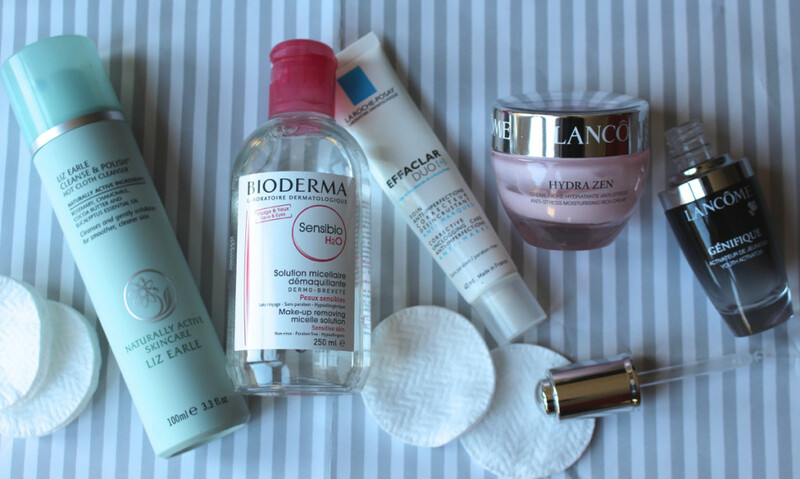 And there you have it, my evening skincare routine and the 5 go-to products that my baby face swears by. Now, tell me yours? Previous Post Do I Bring My Bangs Back?